Heritage: Something passed down from generation to generation. It used to be common in boat building, as family-run boat yards built just a handful of boats each year. Today, corporations run many of the boat yards, and mainstream production boats share little with traditional hand-made craft. So it is interesting to see a new vessel that has a family heritage, but built in a large corporate facility...the Solo 43. The Halvorsen family has been building boats continuously for five generations. It began in 1870 when farmer Halvor Andersen started building dinghies during the winter months in Norway. His son Lars went on to New York to learn the boat building trade at Luders and Elco, two well-known American boat builders of that era. The family moved to Sydney, Australia, in 1925, and since that time, they&apos;ve built just about every possible type of pleasure and commercial boat. During WWII, they built hundreds of vessels for the Australian and U.S. armies, and later even got into the sailboat market. Their most famous effort was Gretel, the 1962 Australian challenger for the America&apos;s Cup. In 1975, descendant Harvey Halvorsen formed Kong & Halvorsen Marine with the late Joseph Kong. Originally based in Hong Kong, Kong & Halvorsen was the first boat building joint venture in China in 1980-generating that country&apos;s first income from exporting goods through an industrial duty-free zone in Shenzhen, in southern China. Today, the fifth generation is represented by Mark Halvorsen, who runs Halvorsen Marine Ltd. (renamed from Kong & Halvorsen). Halvorsen Marine has built hundreds of Island Gypsys, as well as numerous patrol boats and passenger ferries, including a 200-passenger air cushion vessel capable of 35 knots. It is the largest fiberglass boat ever built in China. Continued involvement in commercial boat building has limited the growth of the pleasure boat line, so a few years ago Harvey Halvorsen decided to look into expanding into other yards in southern China. Harvey and Mark traveled to Taiwan to explore possibilities there as well. It was there they met Howard Chen. Coincidentally, Chen wanted to set up a new boat building facility in southern China, and was looking for a suitable partner and project to get it going. They soon signed a joint venture agreement. Chen would create Jet-Tern Marine, the yard in China, and Jet-Tern&apos;s first project would be a Halvorsen boat for the long-range trawler market. The new boat would be distributed by a new company, International Yacht Distributors, and Halvorsen would be responsible for setting up a new dealer network for sales and support. The boat would not be an Island Gypsy. Harvey went to his drawing board, and the result is the Solo 43. Let&apos;s check out the Solo 43. My first impression of the boat was its balanced profile. The boat looks good from all angles. The forward section is clean, and the built-in Portuguese bridge and raked pilothouse windows work well together. Port and starboard covered side decks lead aft to a covered aft cockpit. The Solo is a nice looking boat. The only exterior wood is a varnished caprail from midships aft, as well as the name boards for the running lights. That&apos;s it. The rest is clean fiberglass and stainless steel. And the glasswork on this boat is quite nice. The person responsible for this tooling gets a gold star, as all fittings, vents, fuel and water fills, even the cleats, are recessed and off the deck. There are two side doors for access from the dock. Matt Gambrill, of Calvert Marina in Solomons, Maryland, and owner of Hull #4, told me future boats will have these doors located farther aft, as their current position is 8&apos; 6" from the transom, making them unusable from finger piers in many marinas. A large bollard on the foredeck is great for dock lines, and the foredeck is ringed with a 12- inch bulwark, with 20-inch stainless steel railing overtop. The Portuguese bridge has a center-line door that swings closed for good security behind the bridge. There are two massive lockers inside the bridge structure, great for fenders and lines. I was pleasantly surprised to measure 38/40 inches of walking clearance between the bridge and the front of the piloth ouse. Remember, this is only a 43-foot boat. All boats are a compromise, but on the Solo, no compromise was made at the expense of moving around the exterior. Even the side decks are 20 inches wide at foot level, and it is a pleasure to walk around the boat without turning or twisting. I also really liked how all deck hardware is several inches off the deck. Vents, cleats, water and fuel fills are off the deck and recessed. In years to come, this will translate into a lack of deck leaks from aging, cracked seals and fittings that work loose over time. And the look is clean and uncluttered. There is an average of 6&apos; 5" headroom on the side decks under the overhead boat deck, which extends 24/26 inches out over the decks on both sides. There is a 24-inch wide transom door for access from the swim platform, complete with a heavy latch to keep it shut under way. Interestingly, the swim platform is hinged, and can be raised up to the transom and secured. A hinged platform is a bit unusual, although I can think of two reasons for having it. One is that some marinas charge by overall length, and this may translate into $$$ savings over time. The second reason is perhaps more obscure, but still valid. When cruising foreign waters, especially tropical islands, locals often come out to sell, trade, and check you out. Making the swim platform disappear is a good thing. One must be cautious when a canoe full of locals arrives in a remote anchorage. A swim platform is almost a welcome mat, and they&apos;ll find it natural to board the swim platform while they make their pitch and show you their wares. Oops, now they are on your boat, uninvited. It&apos;s a "condition yellow" thing. The aft cockpit is 5 feet long and there is a lazarette hatch (4 feet by 2 feet) in the center of the cockpit. The space is 30 inches deep, with good access to steering gear, and lots of room for boat stuff. The wet exhaust is well out of the way on the starboard side of the lazarette. All deck surfaces have raised, molded nonskid, and it is well done. The excellent fiberglass work is surprising, considering this is Hull #4 from a brand-new yard. A seven-step ladder goes up to the boat deck through a tinted hatch. It would be an easy matter to close off this cockpit area with canvas for cruising in cooler weather, extending the living area. As I climbed the almost-vertical ladder up to the boat deck, I thought how difficult it would be to bring a plate of crab cake sandwiches up to the flybridge. It is not user-friendly. Surprise! As my head popped through the hatch, I immediately spotted a door up to the boat deck from the pilothouse. Cool! I doubt I would ever again use the ladder. Having inside access from the pilothouse is great, even if it does rob some space from the interior. Some boats solve the access problem with steps from the bridge deck, which also works well. Having a vertical ladder as the only access is a relic from the dark ages. The boat deck is 11 feet long to a raised flybridge platform, which has a center-line helm station. I would prefer having the upper helm off center, on whichever side the boat backs, to make close quarter maneuvering easier. It is a purely personal thing, but it would be nice to see down the side of the boat from this helm. That makes it much safer to approach someone or something in the water, or to maneuver near a fuel dock from the flybridge. Due to the length of the pilothouse, I could not see the bow from the upper helm. Even standing up, I could just see the tip of the burgee on top of the foredeck railing. But on open water, the flybridge would be very nice, and, with such great access, I can have my crab cake and eat it too! The mast was not yet installed on Hull #4, but it will be hinged to allow bridge clearance of less than 14 feet. When I walked into the saloon through the aft cockpit door, all I could say was: Wow! What a different interior! The central galley attracted my attention immediately. The high-gloss varnish of the woodwork glistened in the morning light, and the large windows made for a bright, cheery interior. Hull #4 was decorated for us by Matt&apos;s lady friend, Fenner Borkowski, and I felt as if I had just walked into a bar in Casablanca. Cherry is used instead of teak, and the overall effect is chic and elegant-a gentleman&apos;s yacht. While the general quality of the varnish work shows Jet- Tern&apos;s crew is still evolving their craft, this boat still seemed more like a Manhattan penthouse than a cruising trawler. I also noticed right away the trade-off made for those wide side decks and open deck space. The saloon area is on the small side, measuring only 7 feet by 10 feet. An L-shaped settee is built in the aft, port side of the saloon. Unfortunately, it isn&apos;t long enough to qualify as a berth under way. There is a bureau opposite the settee, and that&apos;s about it. It is a small saloon. On both sides of the galley are passages forward. The starboard steps lead up to the pilothouse, the port steps go down to the living spaces. The U-shaped galley includes a propane stove with oven, a Norcold refrigerator, a Grunert cold plate freezer, and Corian counters. It is compact, and there isn&apos;t an abundance of storage for provisions or cooking equipment. So where does one store provisions for long cruises? Lifting a hatch on the saloon sole uncovers a space between engine room and lazarette bulkheads. The crawl space is the boat&apos;s commissary, complete with wine cellar, provision cabinets, and storage for large quantities of food and gear. Even golf clubs. It is easy to get into this space, so just think a meal or two ahead to minimize trips to the "basement." The commissary also revealed Jet-Tern&apos;s use of fiberglass I-beams for structural members to hold up the cabin sole, rather than wood. No doubt we&apos;ll see more of this in the future. I measured a minimum of 6&apos; 4" headroom throughout the Solo 43. Up four steps past the galley brings us to the pilothouse. The forward-facing windows are large and offer great visibility, as do side windows and ports on the aft end of the house. With the sliding hatch up to the flybridge fully open, the impression is almost like having a sunroof on the port side of the pilothouse. There is also a large overhead opening hatch. The Solo 43 has a watch berth behind a 6-foot settee, and the foot of the berth slides out over the steps up to the flybridge, for a berth that is 6&apos; 8" long. There is storage under the settee and the helm console has plenty of surface for electronics. A small slideout shelf is the only place to put a paper chart. Does this signal Halvorsen&apos;s acknowledgement that paper charts will be history in the next century? With all three doors open, visibility from the pilothouse in every direction is excellent. The side Dutch doors are off the deck several inches, so standing water will not easily enter the pilothouse. 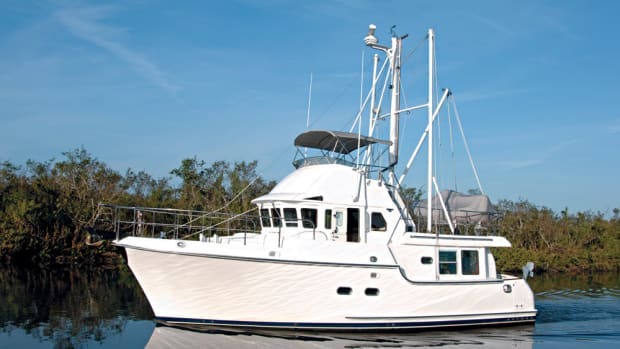 The Solo 43 doesn&apos;t have the largest pilothouse around, but it is nice and cozy for a couple enjoying the trawler life. Everything is within easy reach, and there are many hand holds. Back in the saloon, I walked down the portside passage to the living spaces. Here again, I was surprised at what I saw. Instead of a dark, narrow passageway, the feeling was exactly the opposite. There is a washer/dryer unit at the bottom of the steps, and forward of that is the aft end of the guest stateroom. Instead of extending the cabin&apos;s bulkhead full length toward the center of the boat, the Solo&apos;s guest cabin has a set of folding doors that literally remove part of the bulkhead and doorway to the guest cabin. With these doors folded out of the way, the guest cabin becomes part of the open passageway to the master stateroom and two heads. The result is a large common area, measuring 6 feet by 5 feet, and it really opens up the interior. Opening ports in every area are large (16-inch by 8-inch) and bring in light from all directions. It is a very clever use of space and light, and the feeling is quite different from going below in a traditional teak interior. There is an insulated door into the engine room from this common area. It measures 20 inches wide by 50 inches tall. The door and attached frame are a nice piece of work. The first couple of feet into the engine space has 5&apos; 4" headroom, which makes it relatively easy to make the transition from standing to stooping into the rest of the engine room, which averages 45 inches of headroom. It&apos;s tight but not too bad, as the single engine doesn&apos;t gobble up interior volume as would a twin engine installation. 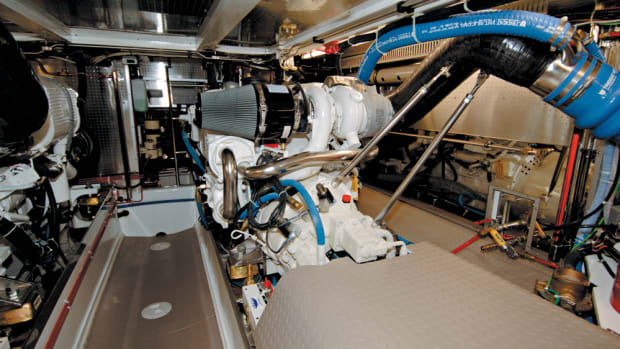 The Cummins 6BT5.9-M diesel is mounted between the boat&apos;s fuel tanks in the 11-footlong engine room. A 12kW Westerbeke generator is located aft of the main engine, and all plumbing, fuel lines, and wiring run around the perimeter of the space. The fuel management system is just inside the access door. As is typical in below-saloon engine rooms, panels in the saloon sole lift for major work, but simply checking fluids and levels can be done from the door access. One intriguing set of hoses and valves on the starboard-side of the engine room led me to discover the one thing on this boat that completely baffled me: the manual bilge pump. It is a single pump with multiple pickups throughout the boat, and where do you think they installed it? Well, the steps that lead up to the pilothouse are constructed as a single hinged unit, and underneath this four-step box is where you&apos;ll find the bilge pump. Hull #4 did not have a supporting ram to hold the box up, so it requires two people to get the pump going...one to hold the steps, one to man the pump. The image of someone on his hands and knees, pumping away with a 50-pound box waiting to swing down and kill him, is more than a little scary. And access to the pump&apos;s manifold and valving to the bilge pickups needs rethinking. Located on the starboard-side of the forward engine room bulkhead, the manifold is directly underneath the pump, yet completely unreachable. The nearest hatch opens over the boat&apos;s water heater. Please, Jet-Tern Marine, get the pump and valves together, where they can be easily and comfortably manned. How about on a common area bulkhead? The Solo is keel cooled with a Fernstrum Gridcooler. The boat&apos;s wet exhaust exits near the transom on the starboard side. Fuel tanks all have sight gauges, and drains to remove water and sediment from the tanks. I like it. The guest stateroom is a simple cabin, with two single bunks. The top berth is hinged, and swings down. It makes a fine reading room. The guest cabin doesn&apos;t lend itself to be an office, as there isn&apos;t quite the space for a desk, but a creative owner will no doubt figure out a solution. Which brings me to ponder a question. In so many ways, the Solo 43 is a great boat for one couple. The small saloon and galley space don&apos;t really make for large parties, and the rest of the boat is well suited for two people. That&apos;s fine, and many would agree that accommodations are silly to drag around for guests if you rarely have any. So why are there two heads on this boat? Both are palatial compared to other boats, even larger ones. Each head has a separate shower, and the master head even has a bathtub. Why such a nice second head, especially given the small size of the guest cabin? I don&apos;t know the answer. I&apos;m sure some people will want two heads no matter what, but is it really necessary? Maybe a ultility room would be better. I thought about this use of space while standing quietly in the common area. When the owners retire into their stateroom and close their door, what&apos;s left? With the folded doors of the guest cabin out of the way, the guest cabin and the common area visually combine. The space is no longer a small cabin, but a really large one. Perhaps that&apos;s the answer. It&apos;s a clever layout. The master stateroom is nice because there are four opening ports in addition to the overhead hatch. Plenty of light makes for a bright interior, and the cherry finish helps. There are two cedar-lined hanging lockers, and numerous drawers and cabinets. As I mentioned, the watertight bulkhead of the chain lockers moves the cabin aft, so the island bed can be made up without gymnastics. The bed is 60 inches wide and 6-1/2 feet long. Nowhere on this boat did I feel "down below." The Solo 43 is a semi-displacement hull form with long range capability. She has a round bilge forward, running to hard chines aft. The reason for this, according to Harvey Halvorsen, "is to provide a soft entry forward and the general characteristics of a round-bilge boat, but with the added advantage of more stability at sea, and at rest, due to the flat stern sections." Looking at the reality of how most people will use this vessel, Halvorsen continued: "While the Solos are trans-Atlantic capable, most people coastal cruise, so we believe a more comfortable ride with less roll is more important than the added range a full, roundbilge bottom will provide." As we left the slip, the Solo 43 handled predictably. With her 23-inch by 22-inch propeller, she backs to starboard, and her large rudder is a big help in close quarters. The Solo tracked well as we loafed across Patuxent River, directly underneath the gymnastic rolls of two Navy F-18 fighters from nearby Patuxent Naval Air Station. Even with the Solo&apos;s pilothouse doors closed, the jets&apos; furious thunder was awesome. The sound of freedom. The Solo 43 is the first in the new Solo series. A 47-footer is on the way, and a 58-foot Solo has already been announced. Base price of the Solo 43 is more than $400,000, but not by much, which makes it competitive in today&apos;s cruising motorboat market. Her larger sister benefits from a larger saloon area, which should please potential buyers wanting more room. But for a couple looking for a boat with several clever, unique features, in an overall design that remains traditional, the Solo 43 is worth a look. The Solo is quite a departure from its Island Gypsy cousins, and reflects thinking that is refreshingly different. The boat will be popular, but not for staying at the dock. If I were to buy a Solo, I already have her name. I&apos;d just have to call her O Solo Mio!